Expected symptoms: Minor stomach upset can occur. What to do: Wash exposed skin with soap and water. Wipe out mouth with a wet wash cloth and give your child a drink of water to wash the glue down to the stomach. Note: If your child has gotten glue into their eyes, call the Missouri Poison Center now for help on how to rinse the eyes. Glues used for craft and school projects are often left sitting out open on the table, making them an easy reach for young children. Ingestion (or swallowing) of “school glue,” sometimes referred to as white glue or paper glue, is not expected to cause many symptoms. 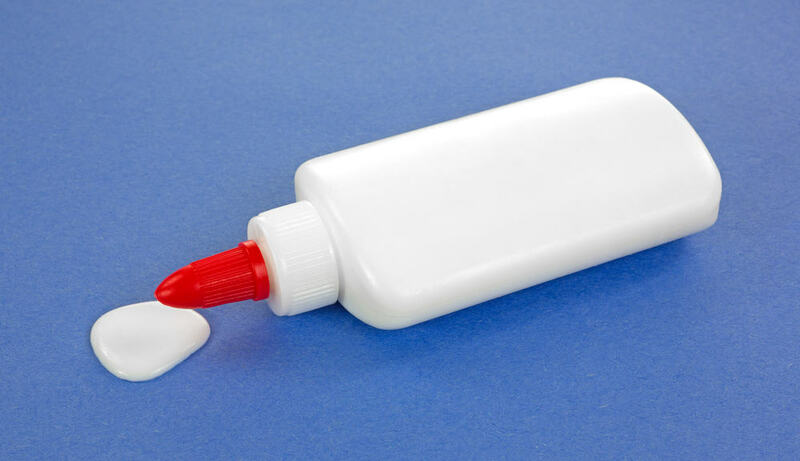 Glue is made up of water with a small amount of a chemical called polyvinyl acetate. The polyvinyl acetate molecules move past each other when wet, but set firm when dry. This is how they stick things together. Paste is very similar to glue but is made up of starch (such as flour) mixed with water. Ingestion of small amounts of glue or paste by children during an unsupervised moment is not an emergency, but can cause minor stomach upset. If you find your child eating glue, take it away from him or her. Wipe any visible glue from around their mouths and fingers, and then wipe out the mouth with a soft, wet cloth. After that, have the child drink some water to wash it down into the stomach. If your child is found with SUPER GLUE, there are additional concerns. The bond created by super glue is much stronger, fingers can be stuck together or stuck to objects such as a table. Be safe and call the Missouri Poison Center at 1-800-222-1222 if there has been an incident with super glue. The poison center is open all day, every day for poisoning emergencies and questions. This information does not apply to hot glue, wood glue, tacky glue, epoxy glue or resin, rubber cement, model glue/adhesive, spray adhesive, or polyurethane adhesives.